A hagiography /ˌhæɡiˈɒɡrəfi/ is a biography of a saint or an ecclesiastical leader. The term hagiography may be used to refer to the biography of a saint or highly developed spiritual being in any of the world's spiritual traditions. Christian hagiographies focus on the lives, and notably the miracles of men and women canonized by the Roman Catholic church, the Anglican Communion, the Eastern Orthodox Church, the Oriental Orthodox churches, and the Church of the East. Other religions such as Buddhism, Hinduism, Islam, Sikhism and Jainism also create and maintain hagiographical texts (such as the Sikh Janamsakhis) concerning saints, gurus and other individuals believed to be imbued with sacred power. Hagiographic works, particularly those of the Middle Ages, can incorporate a record of institutional and local history, and evidence of popular cults, customs, and traditions. However, when referring to modern, non-ecclesiastical works, the term hagiography is often used as a pejorative reference to biographies and histories whose authors are perceived to be uncritical or reverential to their subject. Hagiography constituted an important literary genre in the early Christian church, providing some informational history along with the more inspirational stories and legend. A hagiographic account of an individual saint can constitute a vita or biography, a description of the saint's deeds and/or miracles, or an account of the saint's martyrdom (a passio) - or be a combination of these. 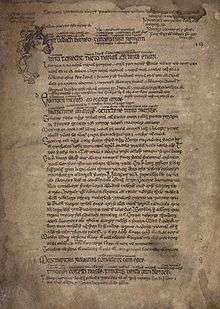 Many of the important hagiographical texts composed in medieval England were written in the vernacular dialect Anglo-Norman. 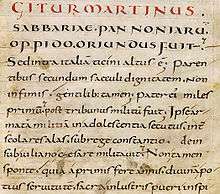 With the introduction of Latin literature into England in the 7th and 8th centuries the genre of the life of the saint grew increasingly popular. When one contrasts it to the popular heroic poem, such as Beowulf, one finds that they share certain common features. In Beowulf, the titular character battles against Grendel and his mother, while the saint, such as Athanasius’ Anthony (one of the original sources for the hagiographic motif) or the character of Guthlac, battles against figures no less substantial in a spiritual sense. Both genres then focus on the hero-warrior figure, but with the distinction that the saint is of a spiritual sort. Of all the English hagiographers no one was more prolific nor so aware of the importance of the genre as Abbot Ælfric of Eynsham. His work The Lives of the Saints (MS Cotton Julius E.7) comprises a set of sermons on saints' days, formerly observed by the English Church. The text comprises two prefaces, one in Latin and one in Old English, and 39 lives beginning on December 25 with the nativity of Christ and ending with three texts to which no saints' days are attached. The text spans the entire year and describes the lives of many saints, both English and continental, and hearkens back to some of the earliest saints of the early church. Example of Greek Orthodox visual hagiography. 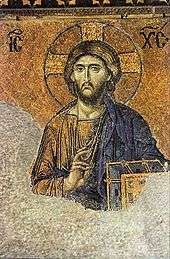 This is one of the best known surviving Byzantine mosaics in Hagia Sophia - Christ Pantocrator flanked by the Virgin Mary and John the Baptist made in the 12th century. The genre of lives of the saints was brought to Kievan Rus' by the South Slavs together with writing and also in translations from the Greek language. In the 11th century, the Rus' began to compile the original life stories of the first Rus'ian saints, e.g. Boris and Gleb, Theodosius Pechersky etc. In the 16th century, Metropolitan Macarius expanded the list of the Rus'ian saints and supervised the compiling process of their life stories. They would all be compiled in the so-called Velikiye chet’yi-minei catalog (Великие Четьи-Минеи, or Great Menaion Reader), consisting of 12 volumes in accordance with each month of the year. They were revised and expanded by St. Dimitry of Rostov in 1684-1705. ↑ from the Greek ἁγιογραφία; hagiographia, from ἅγιος, (h)agios, "holy" or "saint" and γράφειν, graphein, "to write"
↑ Koch, John T. (2006). Celtic Culture: A Historical Encyclopedia. ABC-CLIO. pp. 203–205. ISBN 1-85109-440-7. Retrieved November 23, 2009. ↑ G. Hickes, Dissertatio Epistolaris in Linguarum veterum septentrionalium thesaurus grammatico-criticus et archeologicus (Oxford 1703-05), p. 115. ↑ John Leland, The Collectanea of British affairs, Volume 2. page 408. ↑ R.M. Liuzza Old English News Letter (Medieval Institute, Western Michigan University, 2006) vol 39 No2. page8. Vauchez, André, La sainteté en Occident aux derniers siècles du Moyen Âge (1198-1431) (BEFAR, 241). Rome, 1981. [Engl. transl. : Sainthood in the Later Middle Ages. Cambridge, 1987; Ital. transl. : La santità nel Medioevo. Bologna, 1989]. Herbermann, Charles, ed. (1913). "Hagiography". Catholic Encyclopedia. New York: Robert Appleton Company.